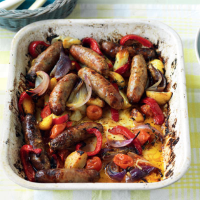 A super simple all-in-one traybake, perfect for a midweek meal. 1. Preheat the oven to 200˚C, gas mark 6. Toss the vegetables, herbs and 1 tbsp olive oil in a large roasting tin and season. Roast for 15 minutes, then stir in the garlic and sit the sausages over the vegetables. Drizzle the sausages with the remaining olive oil and roast for 30 minutes. 2. Drizzle in the balsamic vinegar, taking this opportunity to give the vegetables a good stir, and turn the sausages over. Cook for a further 15-20 minutes, or until golden and caramelised. Serve with a green salad.